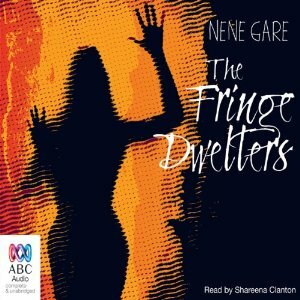 As many readers will know, although there is a debate today about whether or not it is presumptuous for non-Aboriginal authors to speak on behalf of a culture they do not share, The Fringe Dwellers by non-indigenous author Nene Gare was a landmark novel when it was first published in 1961. Larissa Behrendt has just written a book called Finding Eliza in which she analyses the representation of Indigenous people in Australian literature, and I will be interested to see if she includes The Fringe Dwellers in her survey because, despite being first published in 1961, it’s still widely read today. (It was also adapted by Bruce Beresford into an internationally acclaimed film in 1986). I think this is why the dialogue, especially as narrated on this recording, sounds faithful to the characters. The novel is now released in the Text Classics series, but I read it as an audio book, and must make special mention of the narration by Shareena Clanton. Clanton is an Australian actress of Indigenous descent, and you may have seen her on TV in Redfern Now; Miss Fisher’s Murder Mysteries; or currently in Wentworth. Although she has a slight tendency to over-enunciate, her narration of the dialogue is pitch-perfect, rendering a varied cast of characters adroitly. It was this narration which made the book seem utterly authentic despite its non-Indigenous author. Set in an unnamed town in Western Australia, the novel tells the story of two adolescent sisters, Noonah and Trilby Comeaway and their dreams for the future. They were sent away to ‘the mission’ as children, and have returned to their family with their education complete (such as it was). Now, like all young people, they need to find their place in the world but they soon find in different ways that they do not fit anywhere. Trilby is especially discomfited by the chaos of the Aboriginal camp. She loves her family, especially her little brother Bartie who has a passion for art, but – ironically, after dormitory life – she yearns for privacy and order. From mission life she has absorbed enough of mainstream values to judge the squalor and fecklessness as self-inflicted and to feel contemptuous of it, yet the same time she recognises that White Society is making the same judgements which they have no right to do. (This is not an overtly political novel, but you have to be Blind Freddie not to know that Aboriginal dispossession and the fracture of family life is the cause of the poverty). Trilby is a very angry young woman who wants her family to be other than they are, fringe dwellers who have made the best of their lowly position in the world by accepting it yet retaining some of their own values. There is a rich community life; people help one another and share what they have. They are adept at using limited resources and show initiative in building their shanties from recycled castoff materials. And while drinking and gambling bring problems of one sort or another, they provide entertainment in a society that denies them access to the other forms of entertainment in the town. Trilby, however, can see that these qualities which make camp life attractive, also cement their position so that they will always be excluded from mainstream society and the comfort and opportunity it offers. Trilby’s inchoate ambitions to get away falter when she falls for Felix. She likes him, but she has come to the conclusion that the only way she can achieve her dreams of a neat house with a neat family is to disassociate herself from her family and their lifestyle. For her, Perth beckons as a place where she will fit in, but Felix is pessimistic and tries to make her understand that it won’t be any different there, and worse, that if the only way she can get there is by hitching a ride, she will be vulnerable to creepy White men who don’t fit into their own society and so come lording it up in Aboriginal communities instead. The tragedy which befalls Trilby is emblematic of the paralysis she feels about lack of possibilities open to her. There is kindness from some of the individual White people with whom she interacts, but up against institutional racism and widespread discrimination, she doesn’t stand a chance. Bill at The Australian Legend has reviewed The Fringe Dwellers too. It’s a thoughtful review but #BeWarned there is a spoiler there that I have avoided. The unnamed town is Geraldton WA. I reviewed this a while ago and was a bit harder on Nene Gare than you are. Ooh, you were too! Valid points all of them, but hey, she was writing in the 1960s! Thanks for the link. Let us know if you find the Text Classics edition. I enjoy Introductions – in fact an anthology of Introductions might make a fine compilation of literary essays. I read this too but so long ago – around the time the film came out as I recollect. The film had its controversies as I recollect, but overall it was well-received by indigenous people. I remember being a little uncertain about the “white” telling the indigenous story back then – our consciousnesses were being raised by then – but I like both the book and the film too because there was so little around about indigenous life and culture. Yes, I think that was its value. Now there are plenty of indigenous authors speaking for themselves, but back then this was a book that was as ground-breaking about indigenous living standards as was Ruth Park’s The Harp in the South about working-class poverty. That’s why we do need to read books in the context of their times isn’t it?